On Tuesday, Federal Reserve Chair Jay Powell addressed the Senate Banking Committee and House of Representatives. This is his second congressional testimony. He used the event to report on monetary policy and the current US economic condition and outlook. Powell, appointed in February this year, has raised interest rates twice, each rise foreshadowed by concerns that the US economy would be inhibited from regaining full economic health. Investors tuned in listening for any signs the Fed may deviate from its intent to raise rates and for any snippets on possible negative effects arising from Donald Trump’s trade policy. Powell delivered an upbeat assessment of the US economy, noting an improved job market with an average of 215,000 net new jobs created each month in the first half of this year. Unemployment, is now at 4%, near its lowest level for the past two decades. He added that core inflation of 2.3% sits just above the Fed’s target level of 2% and economic growth is pacing well from their perspective. He also referenced rising wages, improving consumer sentiment and greater employment as key contributors to a stronger economy. Ahead of the testimony, Fed watchers were keen to find out what Powell might have to say about the recent trade wars. Trade policy lies outside the Fed’s responsibilities allowing Powell to sidestep recent questions on this hot topic. However, this time he chose to comment. He said, “Countries that have remained open to trade, that haven’t erected barriers including tariffs, have grown faster” and “had higher incomes and higher productivity”. He alluded to more protectionist countries being worse off than those open to trade. On the face of it these comments appear to contradict Trump’s controversial approach to trade negotiations and what appears to be a US retrenchment from globalisation. Powell affirmed that gradual rate increases would continue “for now” given the supportive economic backdrop. He said it was too soon to say if trade disputes might interfere with those plans. Powell’s carefully worded statement suggested that policy decisions are not on autopilot as many assume. They appear to signal less certainty about the Feds intended rate path towards ‘normalisaton’. The so called ‘neutral rate’ is one that neither spurs nor slows growth and is considered to be a number close to 3.5%. 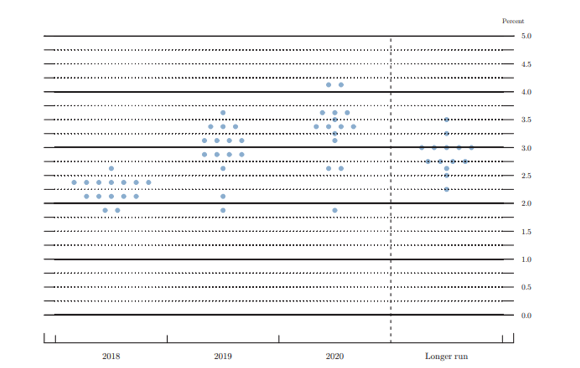 The dot plot graph above, used by the Federal Open Market Committee, signals each member’s forecast for the path of interest rates. This shows a determination and desire to continue to raise rates. 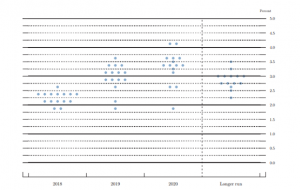 If the dot plots prove accurate, financial conditions will tighten in response to continued strong activity levels across the economy. History tells us that the Fed has a difficult task of managing interest rate levels in accordance with the state of the economy. 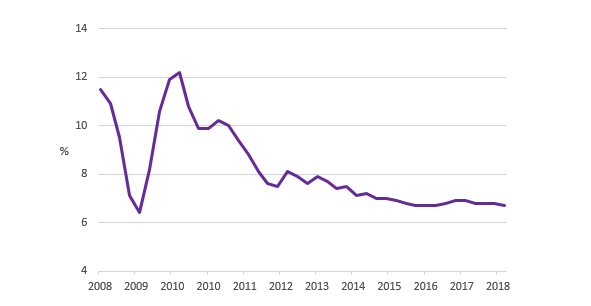 If rates are increased too slowly it may lead to high inflation, which increases the cost of living for individuals; this is especially true if not supported by offsetting wage rises. 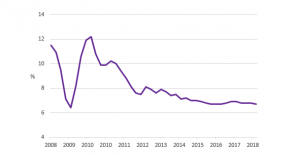 Alternatively, if rates rise too quickly, the economy could weaken and inflation could run below a target level which is set to help achieve maximum employment and price stability. The impact that ongoing trade disputes will have on inflation, monetary policy and growth is uncertain. There are few historic examples of widespread disruptions to learn from. In this regard, Powell’s balancing act has just become a little harder to handle. GDP growth of 6.7% for most economies would be considered a great success. For China, a growth figure of 6.7%, released Monday, seems pedestrian relative to much higher rates of growth 10 years ago; when it was growing at 11.5%, almost twice as fast. 1. A growth rate of 6.7% is in line with expectations. 2. China’s economy today is much larger than it was 10 years ago i.e. apply 1% growth to a base number of 1000 and you get the same product from growth of 10% applied to 100. 3. Growth today is no longer being boosted by aggressive centrally directed bank lending. 4. The authorities have also taken action to restrict ‘shadow-bank’ lending (this is where unregulated entities sell ‘safe’ savings products with the money raised used to build bridges etc). On balance, the growth level in the most recent quarter is healthy and no longer being fuelled by debt. Growth is, arguably, built on sounder foundations. There is of course the ongoing debate as to whether economic data provided by the Chinese authorities should be believed. Western economists question whether data released are accurately calculated and perhaps subjected to manipulation. In recent years the Chinese authorities have, however, made attempts to improve data collation to help reduce wide spread scepticism. From what we hear from our manager partners, the growth numbers being released now appear sensible and are believable. We should not forget that China was only admitted to the World Trade Organisation (WTO) in 2001. This was after a very lengthy negotiating process. Since that point China’s growth is nothing short of spectacular. Critics say the economic miracle we are seeing is swelled by cheap exports assisted by workers earning a low level of wages. We know that in the past this encouraged western companies to switch manufacturing plants to China thereby benefitting from much lower wage bills. However, the competitive edge gained has weakened over time. Other low wage economies joined the game of ‘offshoring’ by luring in western companies and taking away some of the benefits. The central powers in charge in China are now looking at broadening out the country’s economic base. This means continuing to raise wages and stimulating consumption-led, domestic demand. Meanwhile, Donald Trump has China in his sights over trade. The massive surplus favouring China in its trade relations with the USA is, according to Mr Trump, evidence of anti-competitive barriers, behaviour and attitudes. China appears to want to solve this dispute bi-laterally but the rhetoric keeps being ratcheted up. In the long run China’s effort to rebalance its economy will help resolve the trade issue, by slowing exports and encouraging a wider range of imports to satisfy increasing domestic consumption. However, Donald Trump appears to have a different approach when it comes to timing. It is like putting Trump in a US apache helicopter and President Xi in a Chinese junk and measuring the time taken by each mode of transport to cover the same distance. It is clear they both want to tackle the problem, but Trump has a greater sense of speed and urgency. Data issued by the Office for National Statistics (ONS) this week revealed inflation in the UK is unchanged at 2.4% over the 12 months to the end of June 2018. 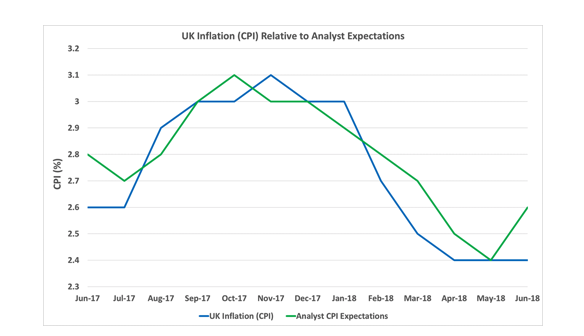 Before the announcement analysts expected UK inflation, measured by the Consumer Price Index (CPI), to increase to 2.6% as demonstrated in the chart below. Given a backdrop of higher global oil prices they thought increased prices at the petrol pumps would push the series upwards. Although the forecasts for a higher number proved wide of the mark, analysts were not wrong on petrol prices. They did in fact push the index up but there were offsetting factors helping to counteract this effect. 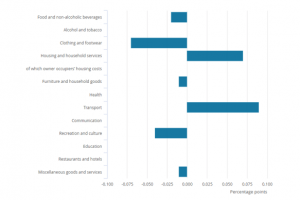 For example, food & drink, clothing & footwear, furniture and products and services around recreation all fell. Analysts say good weather and the World Cup kept consumers out of the department stores; a likely short-lived phenomenon (at least from a sporting perspective). 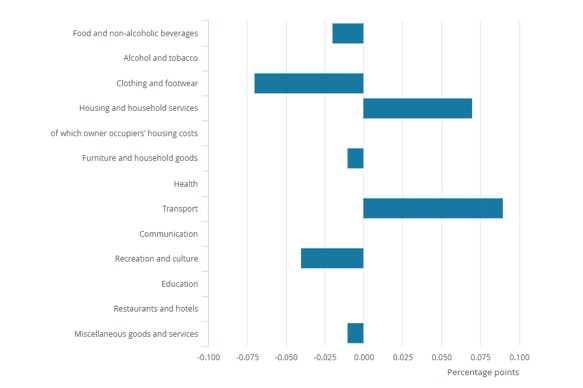 The bar chart below shows the inflation effects by category. We should point out that the data taken from the ONS uses prices which include housing costs (CPIH), whereas CPI, which we quote, does not. Nevertheless, the table containing the expanded range of categories is useful to show how prices are fluctuating in different areas of the economy. Some of these price changes affect us personally, some not. We should also mention that the impact of rising oil prices is recognised under the category ‘transport costs’. From a consumer’s point of view, a slowdown in inflation is a positive. Especially with wage growth no longer languishing below the inflation rate. Spending power in real terms, after taking account of inflation, is no longer being eroded. 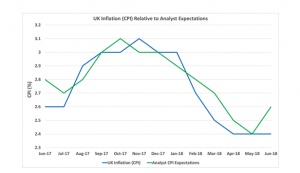 The figures on inflation have further divided opinion on whether the Bank of England should raise rates in August from their current level of 0.50%. At the last Monetary Policy Committee (MPC) meeting the panel voted by a majority of 6-3 to maintain the rate at 0.5%. Expectations of an August hike have now slipped from 89% to 78%, However, this continues to suggest a rate rise is more likely than not. The ‘Doves’ of the economy, who favour low interest rates as a way of promoting economic growth feel now is not the time to hike interest rates. With recent figures showing sluggish wage growth and tame inflation, they feel the MPC should not take risks by putting rates up now. The Hawks however, are gathering strength, observing a healthy labour market where unemployment is at its lowest level since 1975 (4.2%). The MPC will meet again on 2nd August 2018 to decide on interest rates.